Boston, MA (February 5, 2019) – Marathon Tours & Travel (MTT) founded the official Seven Continents Club (SCC) in 1995 when its inaugural Antarctica Marathon and Half-Marathon made it possible for runners to conquer a marathon or half-marathon on all seven continents. One of our early SCC adopters recalled, “I was reading the latest issue of Runner’s World and there was an article about the first marathon in Antarctica (1995) – somewhere I always wanted to go. I was able to get into the second running of the Antarctica Marathon and it was on that trip when I decided to join this new, unique club and run a marathon on all seven continents.” Fast forward 24 years later and the SCC has grown from a short list of dedicated runners to 5700 members. Even more impressive is the number of runners that have completed a marathon or half-marathon on all continents and have earned their Seven Continents Finisher Medal. To date, we have presented the SCC Finisher Medal and Certificate to 478 men and 235 women who completed a marathon on all continents and 19 men and 31 women who completed a half-marathon on all seven continents. In addition, we have several members who have completed this quest multiple times. 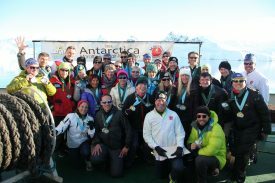 With the twentieth running of the Antarctica Marathon and Half-Marathon this March, an additional 31 runners will complete their seventh continent goal. Amongst them, we will have our first two SCC Finishers from Iceland, Gunnar Armannsson and Unnar Steinn Hjaltason; our first Italian SCC Half-Marathon Finisher, Gianna Venturi; and Steve Caddle will be our first Barbados SCC Finisher. In addition, Svein Holsaeter and Per Ragnar Rogne will be our second and third finishers from Norway and Lenka Hellerova will be become one of two finishers from the Czech Republic, her predecessor also a woman. A special awards ceremony on board the ship will recognize these runners’ accomplishments as well as the top athletes. A significant trend we see in addition to the increase of women SCC members and finishers, is the conversion of Abbott World Marathon Majors (AbbottWMM) Six Star Finishers to Seven Continent Club Finishers. Once they complete the six AbbottWMM (Tokyo, London, Boston, Berlin, Chicago, and New York City) runners are anxious to create their next challenge. While participating in the AbbottWMM series they realize they have already run on three continents and are embracing the goal to run on the remaining four. A recent survey showed that 82% of our SCC members who are pursuing the AbbottWMM are interested in completing a race on all seven continents. The SCC membership spans across 78 countries. In addition to North America, a significant number of members also reside in Australia, China, Germany, New Zealand, Poland, South Africa and the U.K. We are experiencing rapid expansion around the globe as more and more runners seek new goals. Being a member of the Seven Continents Club, the only frequent traveler club for runners, also provides special VIP services to international globetrotting distance runners. Services include personalized guidance on the best destination races to meet the runners interest, budget and help them successfully complete their goals. More about the SCC can be found on www.sevencontinentsclub.com. 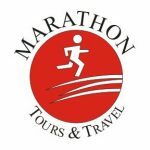 Founded in 1979, Marathon Tours & Travel (MTT) was the first global company to specialize in travel services specifically for runners. Located in Boston, the home of the world’s oldest marathon, MTT is the official North American travel agency for many of the world’s most popular running events including the BAA Boston Marathon, Virgin Money London Marathon and many others. More information can be found on www.marathontours.com.